Make sound financial planning decisions confidently! Recently, there’s been an advertisement campaign by Prudential that might have caught your eyes. In the series of ads, two handsome twin brothers interact with each other. On the surface, one might think the twins’ lifestyles and exercise needs are identical as well. However, as the ad continues it was clear that the twins were more different than previously thought. One of the adverts in Prudential’s myDNA. 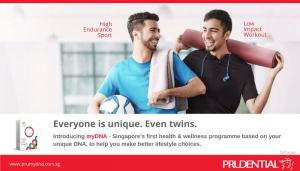 The product, called myDNA, is said to be “Singapore’s First health & wellness programme based on your unique DNA, to help you make better lifestyle choices.” 2/3 of fundMyLife’s co-founders have a background in biology, and we thought it’s time to finally put our PhDs to good use. Disclaimer: our article is an expression of our own opinions and we are not paid by anyone to write this (we’re broke af though). The kit is a collaboration with Prenetics, a Hong Kong-based medical tech company that performs genetic testing. Prenetics has a full suite of DNA tests that ranges from nutrigenomics to cancer gene screens. On the other hand, myDNA features only a small portion of what Prenetics offers. 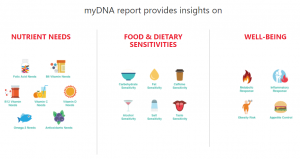 The different categories provided in the myDNA kit, ranging from nutrition to general well-being. In the website, only “Nutrient Needs”, “Food and Dietary Sensitivities”, and “Well-being” are offered from the full suite of screens. This is sensible on several counts, since knowing whether a person has predisposition to something serious, like say, cancer might lead to tricky situations (though the Life Insurance Association has opined that genetic testing results won’t be used to discriminate against potential consumers). In general, even though most of us express the same enzymes in our body, subtle genetic variation will result in an enzyme with increased or reduced function which necessitates awareness and conscious control of the diet. Without further ado, let’s look at some of the interesting things in the screen and the implications of the findings. 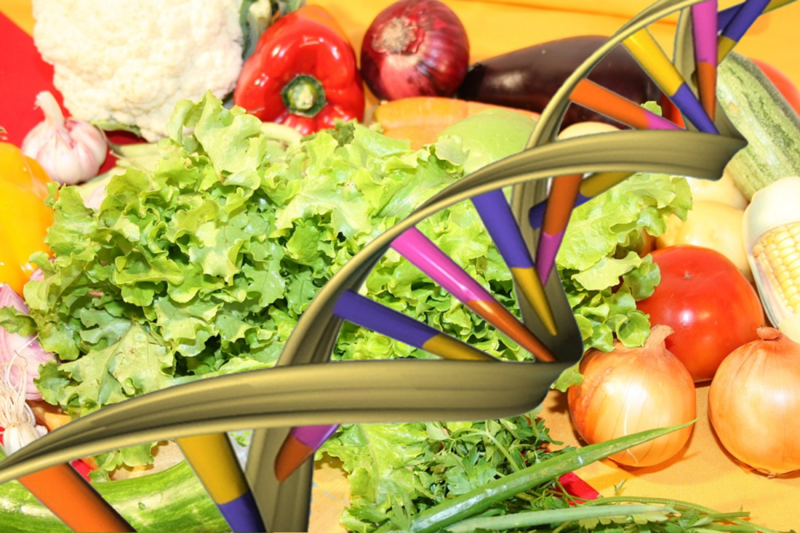 Understanding genetic variation and nutrition allows you to appreciate the impact of our food on our health. Variations in genes leads to different levels of vitamin needs, e.g., folic acid, Vitamin B6, B12, etc. These vitamins are obtained externally via the diet. As such the metabolism will depend on the activity of the enzymes that process the corresponding vitamin. Man, he drank too much coffee in his earlier days. For example, mutations in the gene that encodes MTHFR (methyltetrahydrofolate reductase) leads to inefficient, if not impossible, processing of folic acid and folate into their active form 5-MTHF. 5-MTHF is required to break down another compound in the body called homocysteine. High levels of homocysteine are correlated to higher risk of heart disease, stroke, and other forms of cardiovascular disease. As such, it is important to know whether one has a healthy MTHFR and if not, take steps to alleviate the deficiencies such as 5-MTHF supplements and reduction of foods heavy in folic acid. Given two different individuals with the same diet, there will be a slight difference in how each person processes the food eaten. While the differences might seem trivial, the long-term consequences of these differences are more serious than you think. All of us has at least a friend who has Asian flush; we’d laugh at his/her redness upon imbibing alcohol. 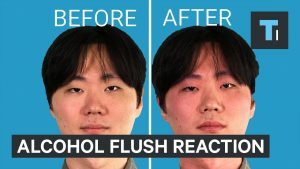 Accumulation of acetaldehyde in the body, generated by the breakdown of alcohol is the main culprit for the Asian flush. While the redness is something to laugh at, accumulation of acetaldehyde in the body is not. Higher levels of acetaldehyde in the body is correlated with higher risk of stomach cancer. While the enzyme ALDH2 reduces the levels of acetaldehyde in the body, there are millions of Asians with variations in the gene that encodes inactive ALDH2. With one copy defective and another normal, the person will suffer a flushed face, quick heartbeat, and nausea. However, if both copies are defective, the person’s ALDH2 will be completely ineffective in getting rid of acetaldehyde, leading to worse symptoms. 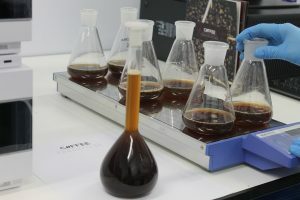 The science of coffee…or the coffee of science? Caffeine is metabolised by an enzyme called CYP1A2 in our liver. The gene encoding CYP1A2 has one of the largest variability in the human genome. The variability is so large that the half-life of caffeine in a body ranges between 1 to 9 hours! Slow metabolizers of caffeine, beware! The risk for heart attack increases for slow metabolisers when they drink 2 or more cups of coffee per day. 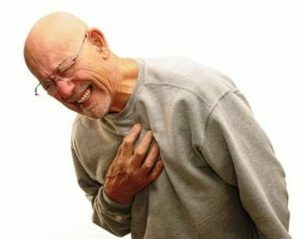 Conversely, those who metabolise caffeine quickly as at lower risk of getting heart attack. Ever wondered how some friends of yours can eat a lot, not exercise, and still maintain a semblance of a figure? 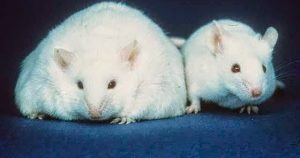 The mouse on the left has variations in genes that correlate to obesity whereas the mouse on the right has normal genes. Your friend might have genetic variations in genes that are correlated with obesity. Unlike folic acid metabolism and caffeine sensitivity that involve only one or two genes, predisposition for obesity involves multiple genes. Scientists found that in a cohort of 38,000 Europeans, slight variations in the FTO gene (also called the fatso gene) were strongly correlated with obesity. Having variation in one copy of this gene alone account for an extra 1.2 kgs, whereas having both copies account for an extra 3 kgs and higher risk of obesity. While scientists clamored to find out more, it turned out that FTO was not directly related to processes in causing obesity but rather affected the expression of other proteins IRX3 and IRX5. That’s all folks! We quite like the idea that the genetic screen offers a guide to tailor your lifestyle to your genes. In short, these tests have a strong scientific basis and it’s fun to see something like this integrated into a real app with practical implications and uses. As the popular saying goes, genetics loads the gun but your diet and lifestyle pull the trigger. Even if you’re predisposed to poorer processing of nutrients, it doesn’t mean you can idle away and blame your genes. Likewise, just because you process your nutrients efficiently doesn’t mean you can be complacent as well. Hence, it’s important that you gain an understanding in genetic variation and nutrition so that you can take charge of your own body. Moreover, insurance companies currently encourage lifestyle choices rather than genetic disposition; it’s more important to consciously choose to maintain a healthy lifestyle than be complacent on your genetics. *fundMyLife does not endorse the product at all – it’s an interesting direction that Prudential decided to take with the introduction of myDNA. Review: Udemy Marketing Class for Insurance Agents | fundMyLife on Opinion: Investing is gambling, or is it? fundMyLifeAdmin on What is fundMyLife? Felix Lim (m:98269750) on What is fundMyLife?